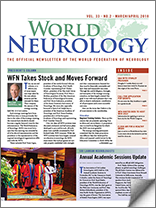 To further its mission to “foster quality neurology and brain health worldwide,” the WFN is offering up to six grants of $25,000 with a maximum spend of $100,000. To see the complete rules and regulations for the 2018 grants, The WFN has been offering grants since 2011. For the list of prior grantees and reports, click here. To download Grants in Aid 2018 Rules and Regulations click here. Young neurologists, less than 10 years from graduating in neurology, from WFN Member Societies are eligible. Preference will be given to residents in areas of World Bank low/lower middle-income countries. The WFN wants to fund low-cost, high-impact educational and outcomes research projects. International cooperation is encouraged with a priority on low-income countries. Note: Projects to provide routine health care and fund ongoing research proposals are not eligible. Projects should be in education, improvement of services (regional or national) or scientific, and require the collection of data to test a hypothesis. Relevance: How does the project directly address the mission of the WFN? Value: What is the return on invested effort in funds and/or time? Viability: Is this a time-limited project with a measurable outcome or is it an initiative that will grow and support the development of further research or care? Synergy: Will this enhance interaction within and between the WFN and among committees, initiatives, and task forces, with outside partners, governmental and non-governmental organizations, the World Health Organization (WHO), and fundraising agencies? Please suggest possible partners. For example: A project on stroke would probably be interesting for the World Stroke Organization (WSO); epilepsy possibly with the International League Against Epilepsy (ILAE). Evaluation: How will the research outcome be measured? Outcomes and goals should be defined in the application. Management: Good governance, transparent monitoring, and clear interim and financial reports are required. The WFN encourages co-sponsored grants. These grants will be co-sponsored by the WFN and a partner organization. The partner organization can be a scientific society, such as ILAE or Movement Disorder Society (MDS), a regional society, or a national society. The partner organization will sign a sponsorship agreement with the WFN to define the shared costs and the role of the individual partners in this project. Project responsibility and reporting will be shared by the WFN and the partner organization. Application due by June 20, 2018. Applicants notified of results by July 31, 2018. Applicants informed of final results by Oct. 3, 2018. Funding of successful applicants begins as soon as it can be arranged thereafter.